Wondering about the most expensive homes sold in Marin County in 2017? You’ve come to the right place! The top end of the Marin County real estate market again saw a strong year with some very noteworthy transactions. You can read my Marin real estate market reports here, but essentially the story was a repeat of 2016 with strong demand outpacing declining inventory. The full diversity of the Marin real estate market is on display with homes in the top 10 ranging from ultra-modern hillside estates to historic seaside ranches. On a personal note, I saw my best year since entering the industry and would like to thank you all for your continued support. The town of Bolinas makes an appearance on the list for the first time in the last two years, but once again Belvedere, Tiburon and Ross take most of the top spots. We only saw one property in the top 10 sold off the Multiple Listing System (MLS), which means it was sold off-market then entered into MLS after the sale. Note that the below list does not include homes sold off-market that were never entered into the MLS system. Below is the complete list of the ten most expensive homes sold in Marin County in 2017, courtesy of Bay Area Real Estate Information Services (BAREIS) which provides all the Multiple Listing Services (MLS) for Marin County. My congratulations to the lucky new owners of these stunning homes! You may click selected images below for more details on each of the most expensive homes sold in Marin County in 2017. TOP MARIN HOME SALE — The most expensive home sold in Marin County in 2017 per MLS was 345 Golden Gate Avenue in Belvedere, which sold for $14,460,000 against a listing price of $16,500,000 after 162 days on market. The description in MLS reads: “Purchased by Silicon Valley venture capitalist Tom Perkins in 1972/73. Close to downtown Tiburon & ferries to SF. Stone paved motor entry, 3-car garage. Apartment over the garage. 6bd/7.5 ba on 3 spacious levels. Grand Salon w/coffered tray ceilings, linen fold paneling, limestone fireplace & sweeping GGB views. Formal DR to seat 18. Master Suite with majestic views, his and her dressing rooms & baths. Elevator, greenhouse, pool, cabanas.” Watch the property video here. NUMBER TWO: 2 Cliff Road in Belvedere — Sold for $12,995,000 after 268 days on market with an original asking price of $15,995,000. The property description in MLS: “The crown jewel of Belvedere Island! 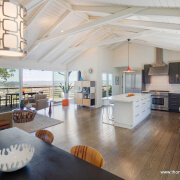 Reminiscent of the Post Ranch Inn in Big Sur, the 1.4 acre waterfront property offers an unparalleled site with approved plans for a 12,000 square foot world class contemporary masterpiece. Blue lagoon pool built into the cliffs! Park-like grounds with all day sun. Sweeping 180 degree water views span from Sausalito to both towers of the GG bridge to downtown SF! Totally private & quiet. 10+ car parking.” Watch the property video here. NUMBER FOUR: 30 Meadow Hill Drive in Tiburon — Sold off MLS for $10,000,000 on May 22, 2017. The property description in MLS: “Eco-friendly, high-tech sanctuary nestled in a quiet canyon above Tiburon Blvd, overlooking Belvedere Lagoon, GG Bridge & SF skyline. Contemporary masterpiece offering privacy & resort-scale living at its best. South-facing & flooded w/natural light, the residence has a large solar installation, consumes very little water & features Nest thermostats throughout. Two-level home w/6 bedrooms, 6 full & 2 1/2 baths, ample living & entertaining spaces.” Watch the property video here. NUMBER FIVE: 1 Upper Road Ross — Sold for $10,000,000 after 51 days on market with an original listing price of $10,995,000. The property description in MLS: “Outstanding Hampton’s style estate perfectly site placed on a park like 1.7 acres. Recently renovated with high end, designer finishes throughout. Great scale with the extensive use of milled woodwork, white marble, high end fixtures & lighting. Compound living with detached guest house, detached pool house, car collector’s garage (8 cars), gym, & yoga room. Approved plans for underground pool. Resort living in the flats just steps to Phoenix Lake!” Watch the property video here. NUMBER SEVEN: 4 Santa Ana Court in Tiburon — Sold in for $8,800,000 with an original listing price of $10,000,000. The property description in MLS: “First time on the market! Breathtaking views from this World Class property with classic elegance in the hills of Tiburon. Custom built in 2001 in one of the most desirable locations offering luxury living, spectacular vistas and grand outdoor entertaining. The residence is a Jewel in one of the most magnificent settings. This family home offers beauty, comfort & serenity high above beautiful SF Bay.” Watch the property video here. NUMBER EIGHT: 11 Circle Drive in Ross — Sold for $8,750,000 with an original listing price of $8,850,000 after just 49 days on market. The property description in MLS: “Grand Ross Estate. Gated w Large Circular Driveway. 9BR, 11BA w 3-car Garage, on approx 2 acres of magnificently landscaped grounds, inc. separate Carriage House w 2-car Garage, Pool House, Guest House, Studio, Gym, Pool & Spa, 2 Outdoor Kitchens, Level lawns with Tree House, Basketball Ct, Volleyball Ct. Main House w Elevator, 6BR En-suite, Formal LR, DR, Fam Rm, Office, Theatre, Chef’s Kitchen, Herb Gardens, 2-Wells.” Watch the property video here. NUMBER NINE: 835 Stony Hill Road in Tiburon — Sold for $8,250,000 in just 16 days with an original listing price of $8,685,000. The property description in MLS: “New Modern Construction: This warm and timeless 5 bedroom, 4.5 bathroom glass, cedar, and steel smart home has intimate views from downtown SF to Mt. Tam. Complete with gated auto court, oversized garage, dramatic foyer, spacious open floor plan with walls of pocketing glass that seamlessly transition to an outdoor kitchen, spa, pool, yard, and bocce ball court. The upper level consists of a luxurious master suite and 4 additional bedrooms.” View the 3-D Home Tour Here. NUMBER TEN: 63 Monte Allegre Road in Ross — Sold for $7,500,000 in 34 days with an original listing price of $8,295,000. The property description in MLS: “Modern elegance & perfection. This exquisite property has it all and offers the quintessential California indoor + outdoor lifestyle. Situated on nearly 3.5 acres of land in Ross, it is rare to find this size lot with such incredible views and outdoor living space. Expansive level lawn, infinity pool & hot tub, exceptional views of Mt. Tam, Ross Valley, & even the lights of SF. Easy commute location & close to Ross School.” Watch the property video here. Where’s the market headed next? You may want to check out my monthly Marin real estate market reports for my commentary on the market conditions here in Marin County. As always, I am happy to help you attain your own real estate goals or answer any questions you might have. Please call or text me at +1.415.847.5584 and I will be in touch right away. I enjoy reading your blog articles each month, Thomas. I hope you and your family have a happy 2018! Thank you, Mary! Happy 2018 to you and yours too! Another wonderful read. Beautiful assortment of properties. Here’s to a fantastic 2018! Thank you, Judy, I always appreciate your comments here on my blog. Wishing you and yours a very happy new year.